Buildings account for about 40 % of energy use in Norway, and efficient energy use is therefore crucially important. Norway uses various instruments to ensure this, including regulatory measures, labelling schemes and information. Building standards have a long history in Norway, and the first energy requirements for buildings were introduced as long ago as 1949. The Ministry of Local Government and Modernisation is responsible for determining the requirements of the Technical Regulations on buildings. The Technical Regulations apply principally to new buildings and when large-scale renovation and alterations are carried out. The regulations set out minimum standards that buildings must meet for their construction to be legal. They include requirements relating to energy use in buildings. New buildings correspond to only about 1-2 % of the building stock per year. On the other hand, buildings have a long lifetime, and the current energy requirements of the regulations will therefore influence energy use for many years to come. The energy requirements have been revised and made stricter a number of times, most recently from 1 January 2016. Building standards have a long history in Norway, and the first energy requirements for buildings were introduced as long ago as 1949. The Ministry of Local Government and Modernisation is responsible for promoting the sustainability of housing and buildings generally. The Norwegian Building Authority plays an important role in preparing amendments to the technical requirements for buildings, for example through research projects and impact assessments. Enova is a state-owned enterprise that was established by the Storting (Norwegian parliament) in 2001, and promotes market introduction of innovative energy and climate technologies in various sectors, including construction. Enova is also responsible for the energy certificate scheme for buildings. 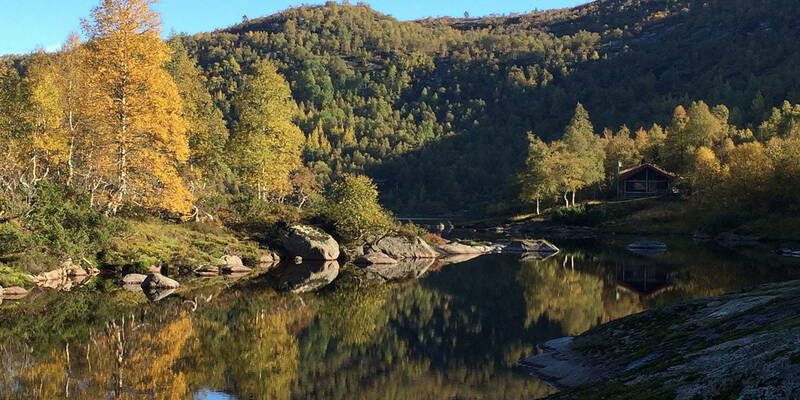 The Norwegian Water Resources and Energy Directorate is responsible for implementing the EU Ecodesign and Energy Labelling Directives in Norway. Oil-fired heating has been widely used in both residential and other buildings, while fuelwood has mainly been used in private homes. In recent years, there has been a switch from fossil energy sources to electricity, district heating and heat pumps for heating purposes in buildings. Sales of fuel oils and heating kerosene have dropped by more than 70 % since 1990, to about 2.7 TWh in 2015. Traditionally, oil-fired heating and fuelwood have been the most widespread local energy solutions, and have functioned well together with the electricity system. However, fossil oil use has been dropping as a result of high taxes and the prospect that a ban on using fossil energy to heat buildings will be introduced at some stage. To ensure the smooth functioning of the energy supply system as a whole, it will be useful to find new heating solutions to avoid strain on the electricity system in winter. A sufficiently large number of customers is required for a district heating system to be developed for an area, since the cost per customer drops as capacity is more fully used. A municipality is entitled to require new buildings to be connected to a district heating system in areas for which a district heating licence has been issued. In 2014, guidelines were published explaining how municipalities can use requirements for mandatory connection to a local district heating system for new buildings. The guidelines were issued jointly by the Ministry of Local Government and Modernisation and the Ministry of Petroleum and Energy. They emphasise that the municipalities can modify the requirements to suit local conditions, for example by specifying which types of buildings are to be connected or defining the geographical areas where the requirements apply. The district heating companies are responsible for providing municipalities with the information they need in order to make good decisions on mandatory connection. This is to make sure that the municipal planning process is as effective as possible. Since 1 July 2010, it has been mandatory in Norway to hold an energy performance certificate for any building that is constructed, sold or rented out. Non-residential buildings exceeding 1000 m2 in size must have an energy certificate that is displayed for the building’s users. These arrangements are intended to improve knowledge and awareness of energy use in buildings. Inspection of large heating, ventilation and air conditioning systems has also been made mandatory to encourage sound operation and inspection routines. Owners of private homes may choose to use a free online system for obtaining energy certificates for buildings , while energy certificates for commercial buildings and new buildings must be filled out by an expert. There is. The heating rating (the colour scale) on the energy performance certificate indicates the extent to which the building can be heated (rooms and hot water) by energy carriers other than fossil fuels and electricity. The energy efficiency ratings on the certificate are between A (very energy-efficient) and G (low energy efficiency). The rating gives an overall assessment of the building’s energy need, i.e. energy in kWh required per square metre for normal use. The rating process applies standard values for factors such as number of residents, indoor temperature and air quality. The energy rating is based on an estimate of delivered energy, and is independent of actual measured energy use. Buildings that meet the requirements of the 2010 Technical Regulations will normally be rated C, while older buildings built in accordance with less strict regulations will have lower ratings. 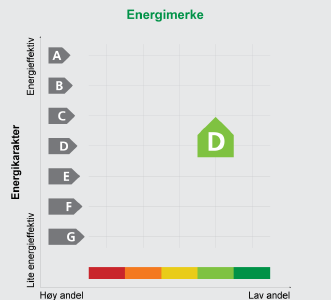 Low-energy buildings and passive houses with efficient heating systems can achieve the rating A or B.